DFI's RESTORATION POWDER removes stains created by hard water and other pollutants on windows, shower doors, skylights, tile, porcelain, stainless steel fixtures, and so much more. 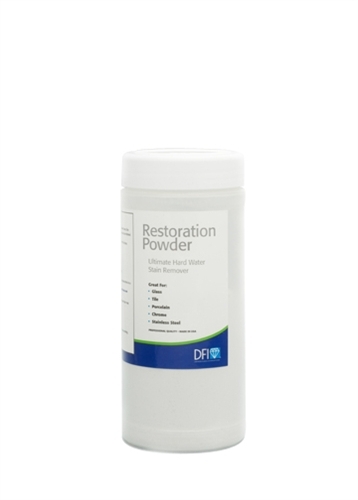 RESTORATION POWDER is an important step in properly preparing surfaces to be treated with a Diamon-Fusion® protective coating. If ordered in multiples of 12 single units per case count (i.e., 12, 24, 36, etc. ), a 15% discount will be applied automatically, no coupon or code needed. This powder really works well. You have to put your muscle into the cleaning, but I have yet to find any residue that this powder can't clean well. Easy to apply and it removes the stains and edge spots caused by a strong cleaner. It's important to keep the glass doors clean and this product works perfectly!